Hop on an eco-friendly Segway for a convenient tour of San Francisco's Golden Gate Park! You'll see all 1,000-plus acres of the park as you learn the rich history of this majestic San Francisco green space on a narrated journey. This unique tour is the perfect way to see Golden Gate Park and its hidden gems. Riding a Segway is similar to riding a bike. It's intuitive, but nobody is born knowing how to operate it. You'll have 20 - 25 minutes of training prior to beginning the tour so you can get familiar with the most innovative transportation device of the millennium. You will practice on the Segway until everyone feels comfortable and ready to tour Golden Gate Park! 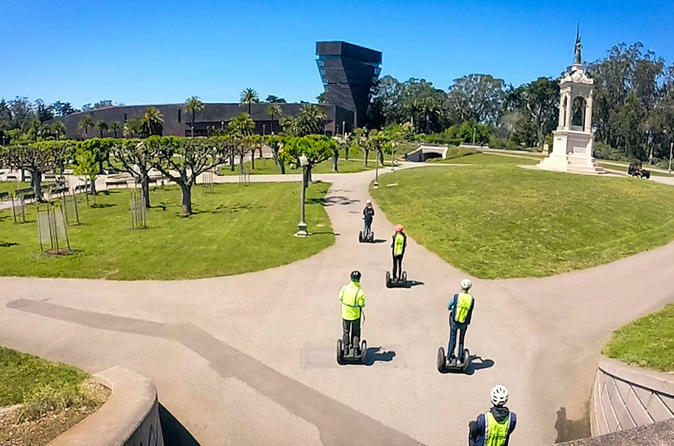 After a brief training session on your Segway, you will be off to enjoy an eco-friendly tour of San Francisco's magnificent Golden Gate Park! You will cover more distance than a typical walking tour and have the opportunity to stop for photos along the way. Your tour guide will point out local landmarks such as Stow Lake, the Conservatory of Flowers, the Lawn Bowling Courts, the California Academy of Sciences, the deYoung Museum and Shakespeare Garden. You will also learn about the history of Golden Gate Park, and how it was transformed in the 1870s from barren sand dunes into the flourishing National Historic Place it is today. Your knowledgeable guide will uncover hidden gems, such as Lily Pond, Storybook Cross, Fern Grotto, an amazing Redwood tree grove, and a pioneer log cabin. This Segway tour is the perfect way to see, learn about and photograph an urban oasis in the heart of San Francisco!